Course text for: Intro-102, Traveling from Confusion to Original Sanity. The course text is sold as a text insert which is placed in a course binder. 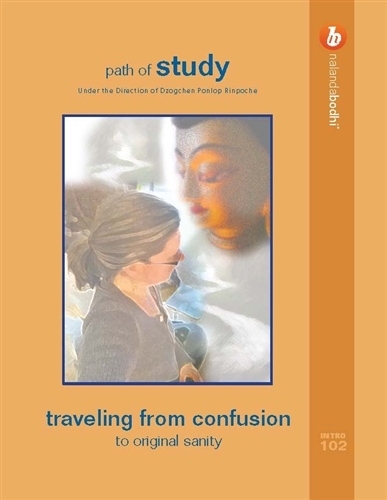 The course binder holds inserts for the four courses in the Intro to Buddhism series. You only need to order the binder once. All of the Introduction to Buddhism inserts fit into the binder, which also includes full color covers for all four inserts, plus a comprehensive table of contents. This system of text inserts and a single binder is a very economical way to purchase course texts. Do not forget to add the binder to the shopping cart if you do not already own one. Without the binder you will not have covers for the inserts and you will not have a table of contents.